Sunday, October 6 at 3:00 p.m. 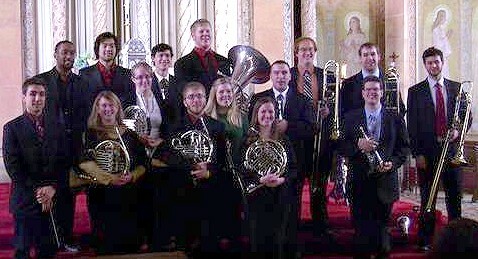 The Buffalo Brass Choir is back to open our 2013-14 Trinity Concert Series on Sunday, October 6, 2013 at 3:00 p.m. Under the baton of Music Director Nick DelBello, the Buffalo Brass presents an exciting program featuring two things that brass does best: fanfares and fugues. Their concert repertoire includes fanfares by Strauss, Ewazen, and Dukas; fugues by Bach and Elgar; and multi-movement works by Bruce Broughton and Henri Tomasi. A free-will offering will be taken, with a suggested $10 donation. For those who might be attending their first Trinity Series concert, our landmark church building is wheelchair accessible (east side entrance) and has off-street parking.